"The only preservative that worked better then water alone" This was the conclusion of Washington State University in a 4-week test comparing preservatives. 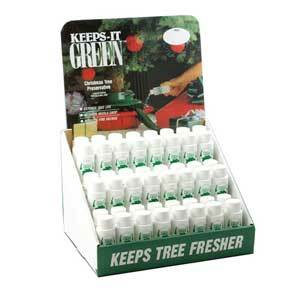 Keeps-it-Green is great for both trees and your profits. Prolongs freshness-extends tree life. Reduces Fire Danger. Retards needle drop. 2 oz size. Make 2 gallons. 48 Pack counter display, 85¢ each.